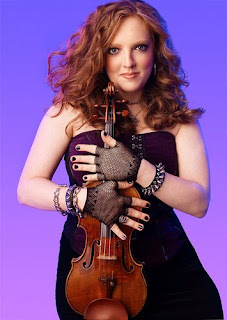 One of my fellow Examiner.com writers, Mona Molarsky, has just published an excellent profile piece on Chicago-based violinist Rachel Barton Pine. Pine is best known for performing classical music, but she also contributes her talents to local metal band Earthen Grave. Many also remember the musician's near-fatal 1995 Metra accident, when at 20-years-old she was caught in a train's closing doors, dragged and thrown under the wheels, resulting in the loss of her lower left leg. Now 34, Pine is about to make her New York solo debut, has recently released an album with Earthen Grave and is about to release a new solo CD of classical material.